Help MFOA pass legislation to ban the sale of cats and dogs in Maine pet shops! Public hearing is April 4, 2019! Act Now! In 2015, Maine Friends of Animals and the advocacy group “Maine Citizens Against Puppy Mills” joined together to sponsor legislation to ban the sale of dogs and cats in Maine pet shops, addressing in particular “puppy mill” suppliers. The bill passed in the State House and Senate and was bound to be first-in-the-nation legislation, only to have it vetoed by Governor LePage. We are back with similar legislation in 2019 and ready to see it finally passed into law, but we need your voice! Know the facts. To learn about L.D. 1311 “An Act Regarding the Sale of Dogs and Cats at Pet Shops” and the cruelty involved with large scale commercial breeding facilities that supply pet shops, visit our website to view the bill overview. fact sheet and recent Sun Journal article. Where: Cross Building (adjacent to Capitol), Committee on Agriculture Conservation and Forestry, Room 214, Augusta, ME. Write a letter that you can send to the ACF committee as testimony, as well as to your State Representative and Senator (hard copy or email), and/or a letter-to-the-editor of your local newspaper! Please summit written testimony directly to the Committee on Agriculture Conservation and Forestry by sending an email to Clerk Dylan Sinclair at ACF@legislature.maine.gov before April 4. Request that he share your comments with committee members. 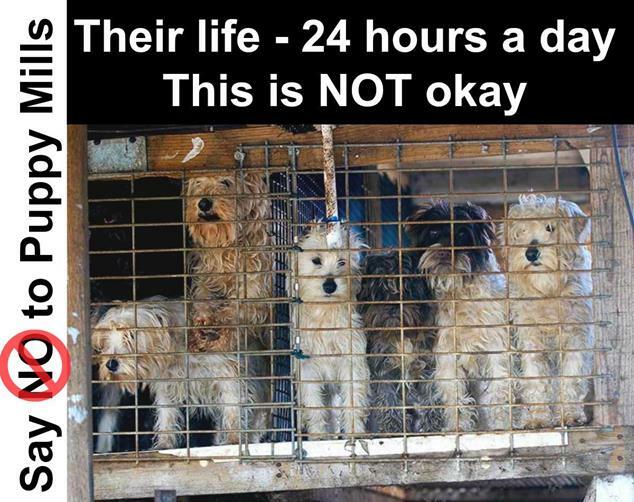 The practice of large-scale commercial breeding facilities where there is little regard for the physical or mental well-being of the animals has to stop. The filthy conditions, wire-floor cages, little or no medical care, exposure to the elements, lack of nutritious food and no access to exercise or social interaction with humans has to stop. Using these animals as a commodity has to stop. Organizing an effective campaign and passing legislation takes money. Please consider making a donation, large or small, today to make sure that this important legislation makes it across the finish line this time! Donate online or mail your needed and greatly appreciated contribution to MFOA, 190 US Route 1, Falmouth, ME 04105.